There is no doubt that the best wedding venue in the Southern Highlands is Jaspers. Luxurious and elegant Jaspers is located in the historic coastal town of Berry in New South Wales. 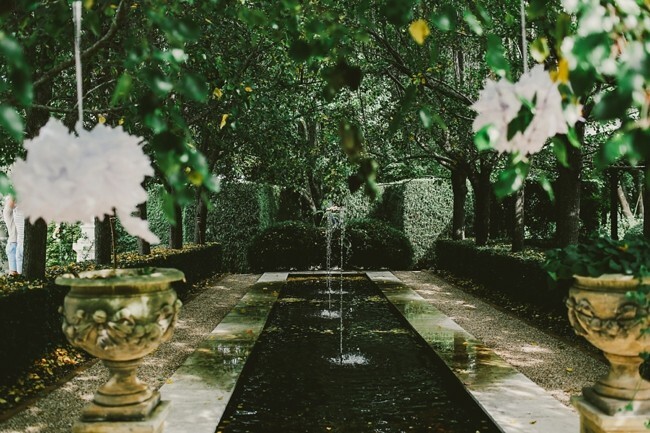 This romantic venue boasts 11 exceptional guest suites, a sparkling pool, beautiful gardens, a scenic courtyard, a deluxe Bridal Salon, a classic bar, and a charmingly graceful reception area (The Orangery). The tables in The Orangery are draped in exclusive white linen and the dining area illuminated by radiant brass carriage lanterns. The Orangery’s antique French doors open to reveal deep verandas and breathtaking garden views. Every morning, all guests are served a hearty and delicious country breakfast in the Lobby at 8:00 am. Additional friends and family members are welcomed to join the bridal party and house guests for the intimate morning meal (at an additional, modest per person cost). Jasper’s skillful chefs produce succulent meals with produce from Terrara House Estate’s organic Vegetable Garden, so you are guaranteed a phenomenal gastronomic experience during your stay. One of the most popular accommodations at Jaspers is the Bridal Salon, which pampers the bridal party on the day of the wedding. • private marble wet area with porcelain baths and toilets. • make-up station and private dressing room for the bride. • an elegant high-tea with fresh-baked scones, delectable gourmet sandwiches, savory tarts, and mouthwatering desserts for an additional modest cost per guest. At Jaspers, happy couples and their guests can enjoy theme weddings such as Winter Weddings and Colonial High Tea Weddings. Winter weddings boast sumptuous menus with seasonal vegetables and hearty entrees. Winter wedding guests will appreciate Jaspers’ chic floral arrangements that incorporate winter berries and blooms. One couple recently enjoyed a 1940s style wedding, replete with glamorous ambiance and breathtaking winter bouquets in the Guest Lobby, Jaspers Schoolhouse Bar, and The Orangery. For entertainment, the Lily Road Band is the top choice for all Jaspers wedding parties. One of the best wedding bands in the region, Lily Road comprises extremely talented wedding singers who pride themselves on providing exceptional wedding entertainment to guests of all ages. The band is based in Sydney and Melbourne but performs all over Australia. Every singer is well-versed in a repertoire of songs for weddings from every era and every style. For example, couples can choose to have 70s music in a classic pop style or 40s music in a classic jazz style, among other choices. Lily Road has a song for every stage of the wedding ceremony: the processional, the signing of the register, and the reception. Band members have performed with contemporary singers such as Taylor Swift, John Legend, Pete Murray, the Whitlams, and INXS. Every Lily Road wedding singer has been a top finalist on talent shows such as Australian Idol, Australia’s Got Talent, and the X-Factor. All Lily Road packages include live music over a 5 hour reception. • Silver Package– which provides dinner music, a first dance song, and party dance music (3 piece band of choice). • Gold Package– which provides ceremony music, dinner music, a first dance, and dance music (4 piece band of choice). • Platinum Package- which provides ceremony music, canapes/hors d’œuvre music, dinner music, a first dance, and dance music (5 piece band of choice). • Deluxe Package– which provides ceremony music, canapes/hors d’œuvre music, dinner music, a first dance, and dance music (8 piece band of choice). Couples can pick band singers and musicians who perform on a variety of instruments such as saxophone, trombone, trumpet, or acoustic guitar. Those who are getting married in Jaspers, Berry, should contact Lily Road musicians from the Sydney wedding band. With an elegant venue and fantastic wedding music, every couple can enjoy a fairy-tale wedding in Berry, Australia.